I drool over Pepperoni Pizza. Seriously, I could eat it seven days a week. 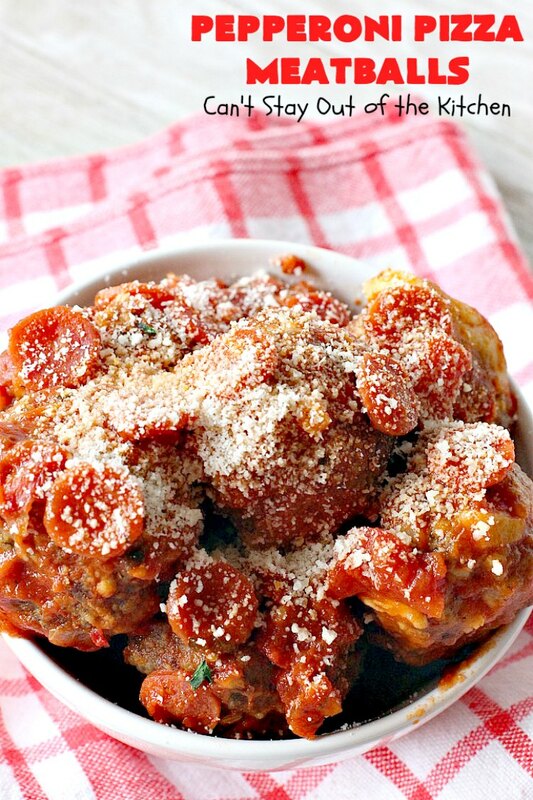 Pepperoni Pizza Meatballs are a terrific version of Pepperoni Pizza. They are irresistibly mouthwatering, savory and sumptuous, hearty and oh so satisfying. 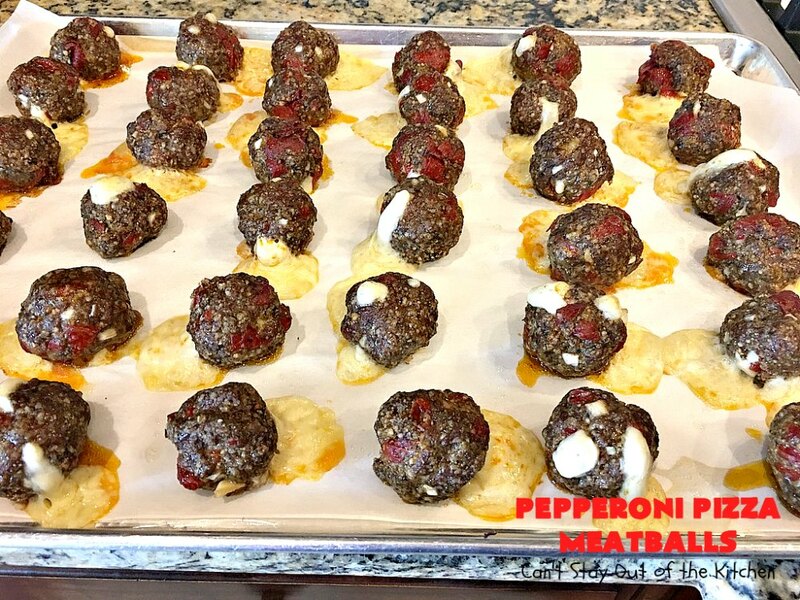 I filled the meatballs with pepperoni and stuffed them with mozzarella cheese cubes. The cheese leaks out of the meatballs while baking, but I add all of it into the marinara sauce when I combine them. The marinara sauce also includes miniature pepperoni pieces, so the whole dish just explodes in pepperoni flavor. I loved it, and so did our company. We hosted our church’s Young at Heart group one Friday night in April. I served six different kinds of meatballs including: Sweet and Sour, Swedish, Spaghetti, Salisbury Steak, Slow Cooker Cocktail and these jewels. These cheesy pepperoni meatballs won high honors from this group. I have to admit I fell in love after the first bite. I made the meatballs gluten free and used a gluten free pasta. But obviously this recipe will work perfectly with regular pasta and regular Italian-style bread crumbs. 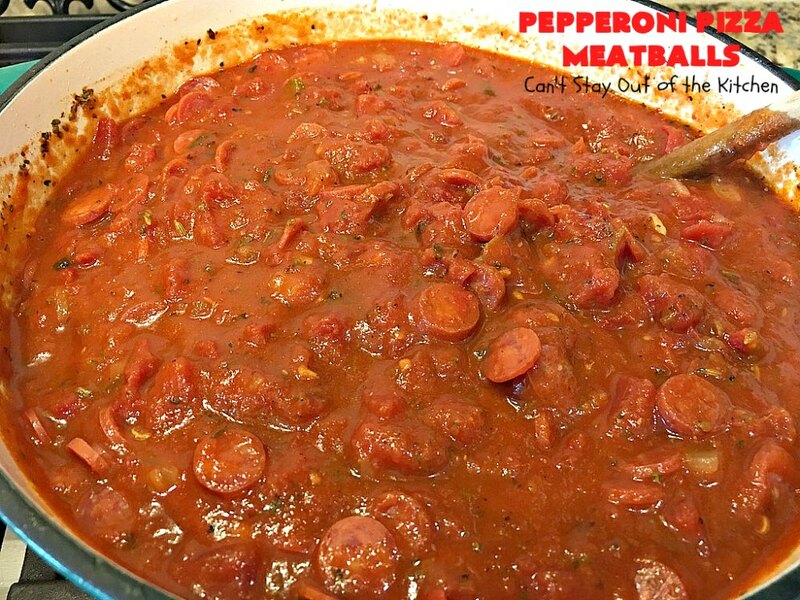 I used regular sized pepperoni cut in eighths for the meatballs and miniature pepperoni for the sauce. 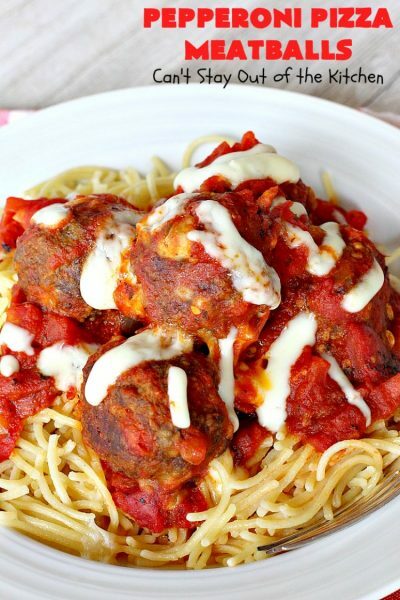 I tried both mozzarella cheese and parmesan cheese over top of the meatballs and both work fine. Although my personal preference was parmesan cheese on top. But you can fool around with this recipe and make it your own. 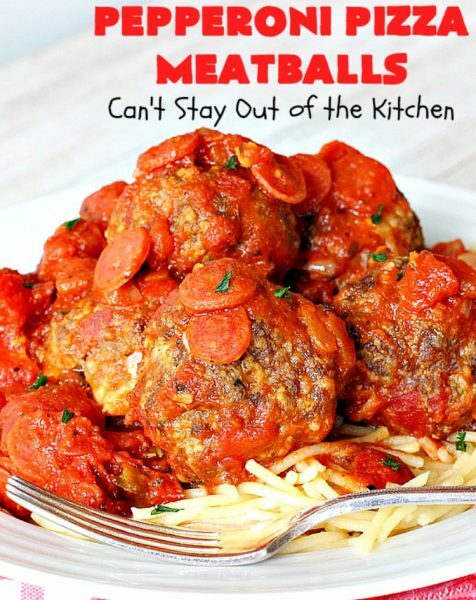 If you’re looking for some of the best comfort food ever, than look no farther than Pepperoni Pizza Meatballs. You will be salivating from the first whiff of the sauce cooking on top of the stove. It’s also a recipe that can be made in the crockpot. 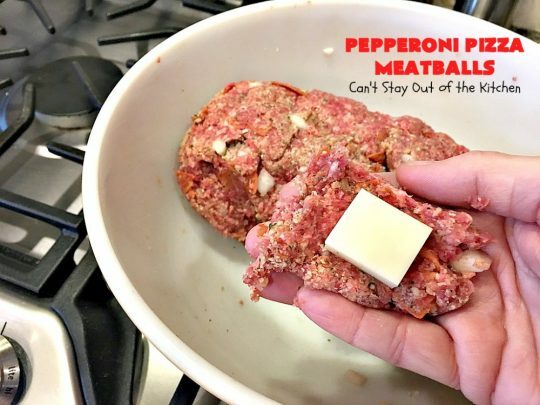 But I personally prefer to pre-bake the meatballs first. Get ready for a gastronomic delight that will wow your family and friends. Pepperoni Pizza Meatballs are irresistible. 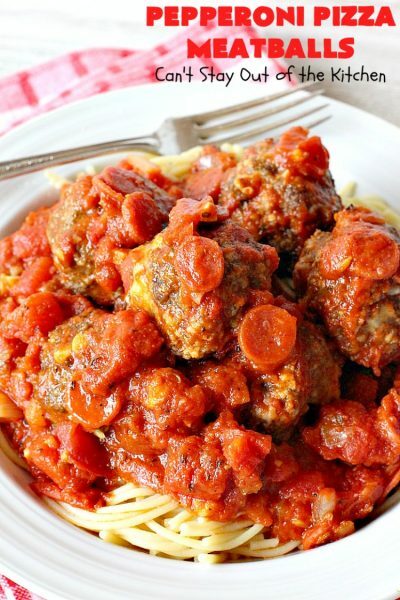 Serve over spaghetti for a mouthwatering meal to die for! I loved all the pepperoni in the sauce and in the meatballs. It provided an explosion of flavor. 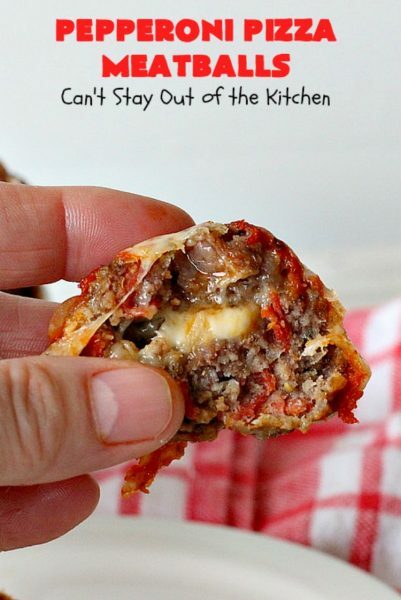 Each meatball is stuffed with a cube of mozzarella cheese. 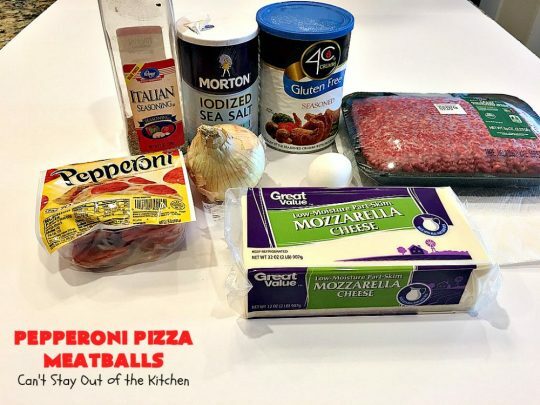 I used these ingredients to make the meatballs. Place beef in a mixing bowl. Add gluten free bread crumbs, onion, eggs, salt, pepper, diced pepperoni and Italian seasoning. Mix ingredients thoroughly with your hands. Take a small amount of beef mixture and place a cube of mozzarella cheese into the center. Roll into balls and place on parchment paper-lined cookie sheet. Bake at 350 for 30-40 minutes. Some of the cheese will ooze out of the meatballs while baking. When adding to sauce scrape all of the cheese from the parchment paper into the sauce. I used these ingredients for the pepperoni sauce. While meatballs are baking, saute onions and garlic in olive oil over medium heat about 1-2 minutes. Add fire-roasted tomatoes, stewed tomatoes, tomato paste, spaghetti sauce, fennel seed, basil and oregano. Stir to combine. Stir to combine. Cover with lid and simmer 20 minutes. 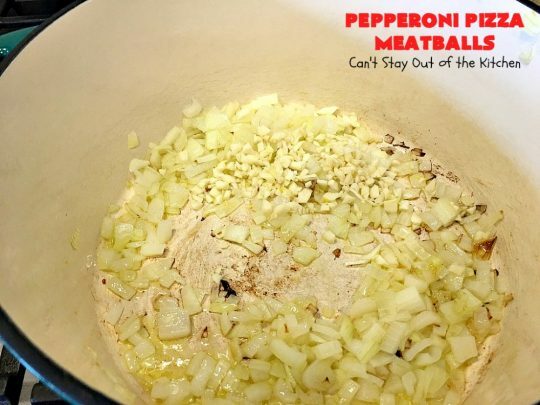 Add meatballs and scrape all of the cheese from the parchment paper into the pot with the pepperoni sauce. 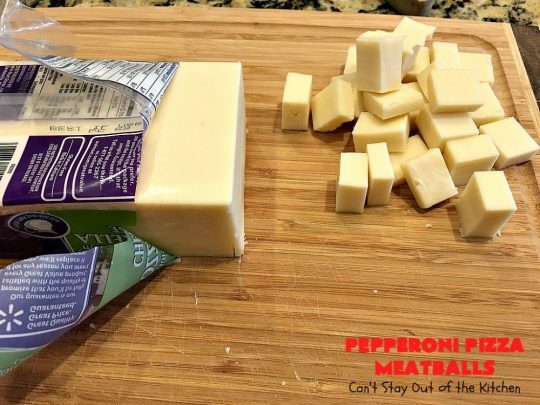 Don’t omit scraping the cheese into the sauce. You want all of that delicious cheese in the sauce. Serve over gluten free pasta. Garnish with additional mozzarella cheese if desired. 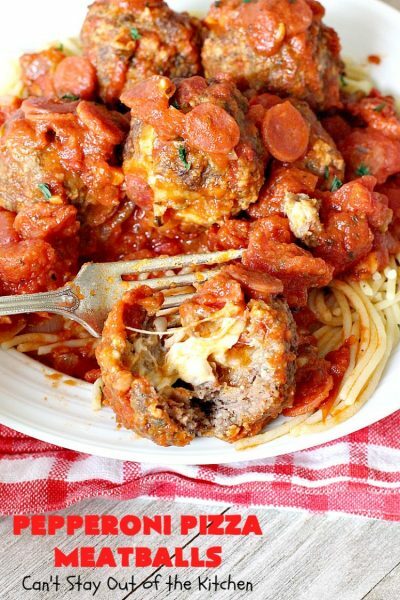 These meatballs are filled with pepperoni and mozzarella cheese. It’s like eating pepperoni pizza but in meatball form! 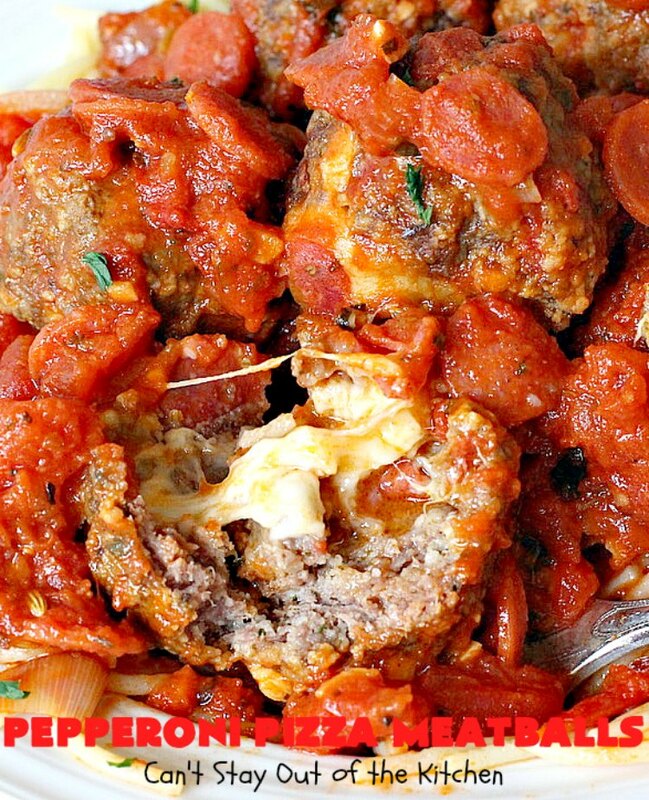 Pepperoni Pizza Meatballs are outrageous fun for company dinners. These mouthwatering and irresistible meatballs are filled with pepperoni and mozzarella cheese. 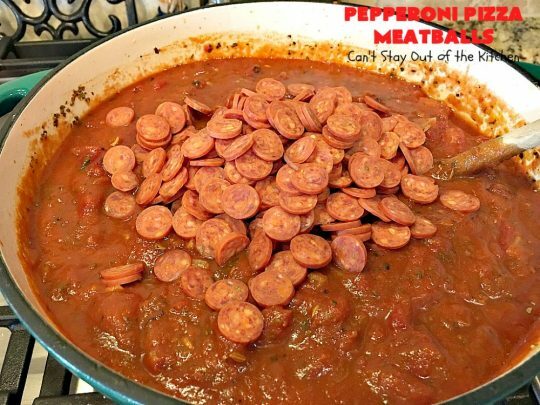 Then they're served in a pepperoni sauce. 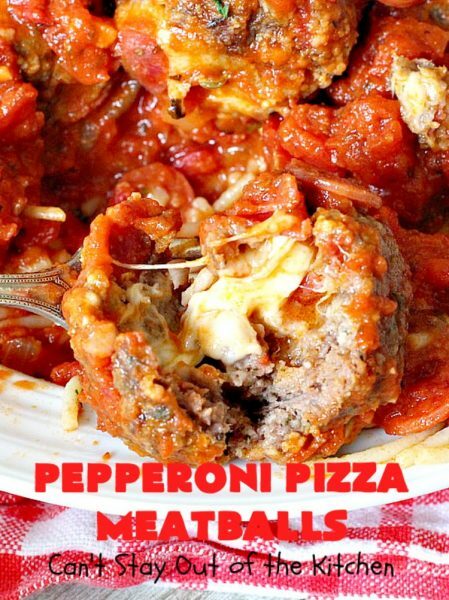 It's like eating Pepperoni Pizza in meatball form! 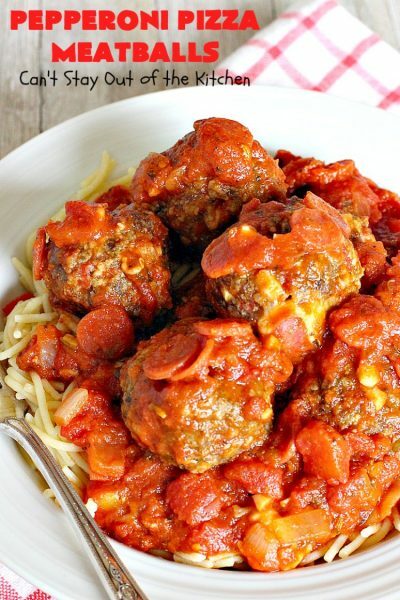 This gluten free recipe is wonderful for company dinners and potlucks. 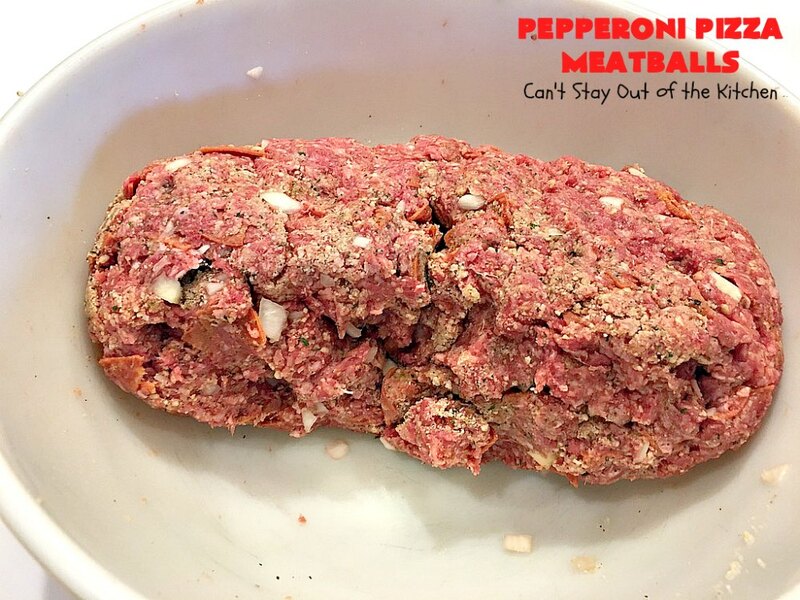 Chop up the large sliced pepperoni into eighths. 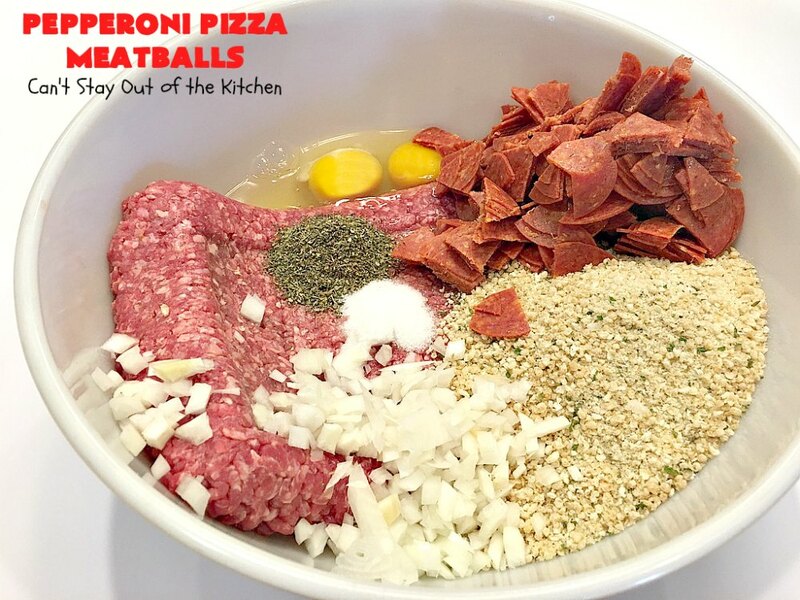 In a large bowl, combine beef, chopped pepperoni, bread crumbs, egg, ¼ cup onion, Italian seasoning and salt. Remove about a golf-ball sized amount of meat for each meatball. Place a mozzarella cheese cube into each meatball and roll up tightly, securing beef mixture around cheese to prevent leaks. 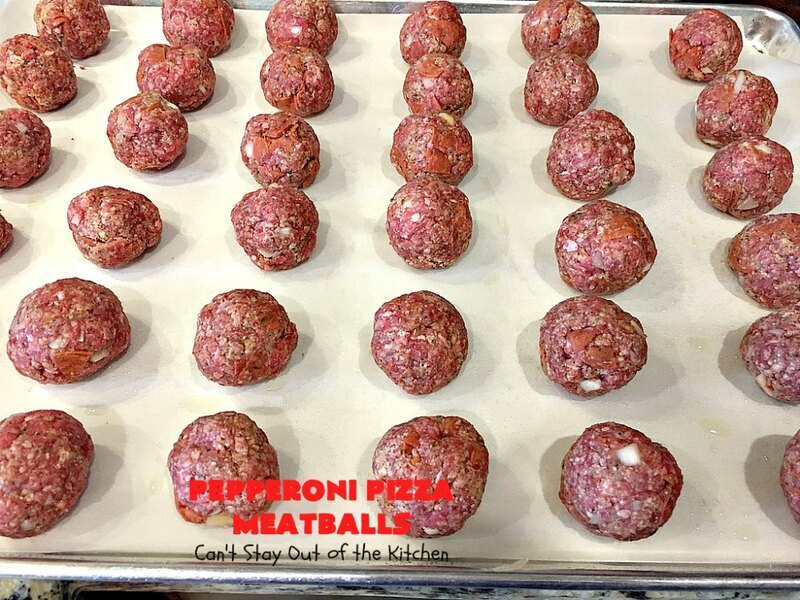 Place meatballs on a lightly sprayed, parchment paper-lined cookie sheet. Bake at 350 for about 30-40 minutes or until done. Meanwhile, in a large Dutch oven, heat olive oil. Then add onion and sauté until translucent – maybe 3 minutes. Stir together and cook another minute – 2 at the most. Add tomatoes, paste, spaghetti sauce and seasonings. I swished out the spaghetti sauce jar with a little water and added that too. 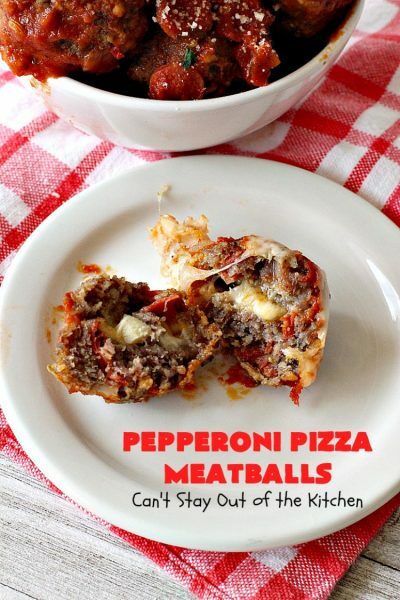 Finally, add cooked meatballs and mini pepperoni. Cover with lid and bring sauce to a simmer. Cook over low to medium heat about 20 minutes until everything is cooked through. To serve: Spread spaghetti on plate. 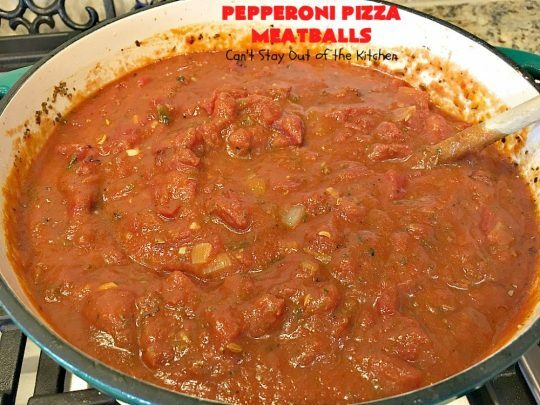 Ladle pepperoni sauce and meatballs over top. NOTE: I find 4C brand gluten free bread crumbs and Ronzoni gluten free pasta at Wal-Mart. 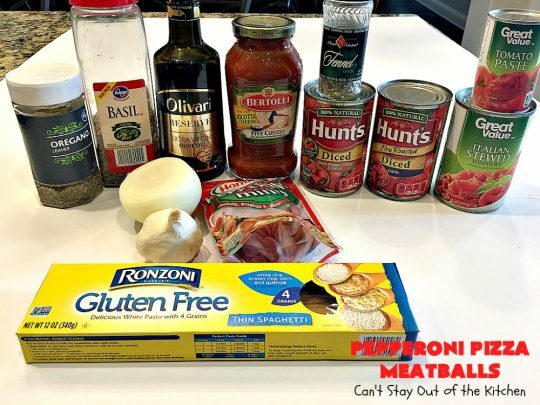 NOTE: You can substitute regular Italian style bread crumbs and regular pasta for the gluten free items in this recipe with excellent results. 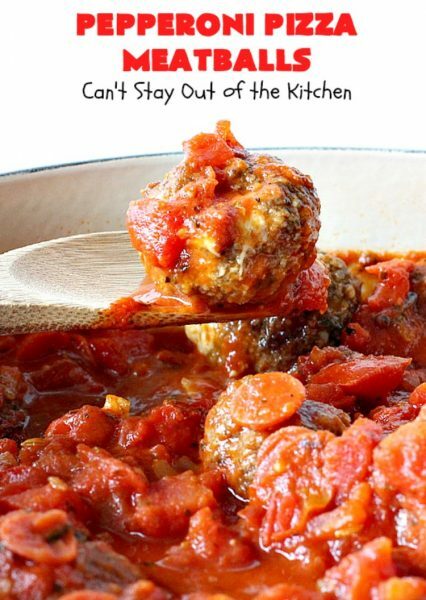 NOTE: Since the meatballs and sauce cook simultaneously, this recipe can be cooked in about 30 minutes. If you love Pepperoni Pizza you’ll love these meatballs. 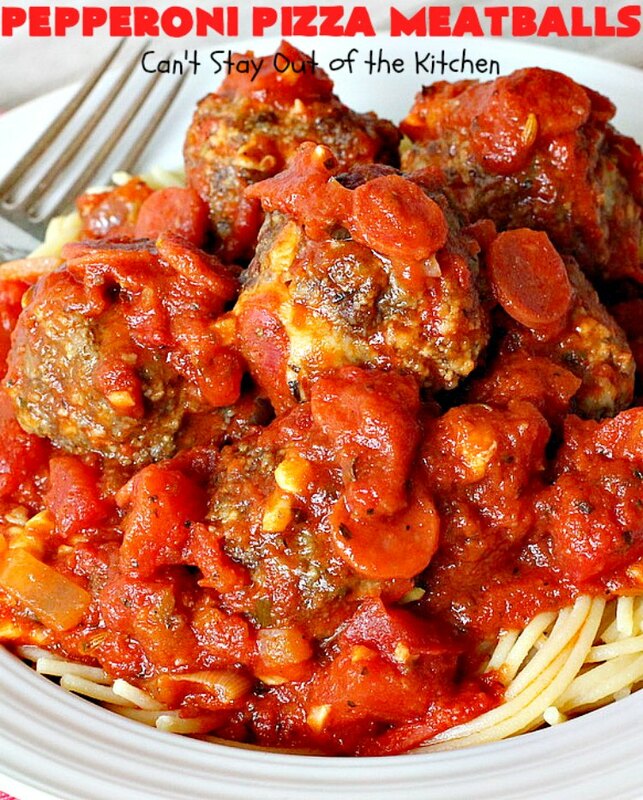 These meatballs are also scrumptious served with Parmesan cheese on top. 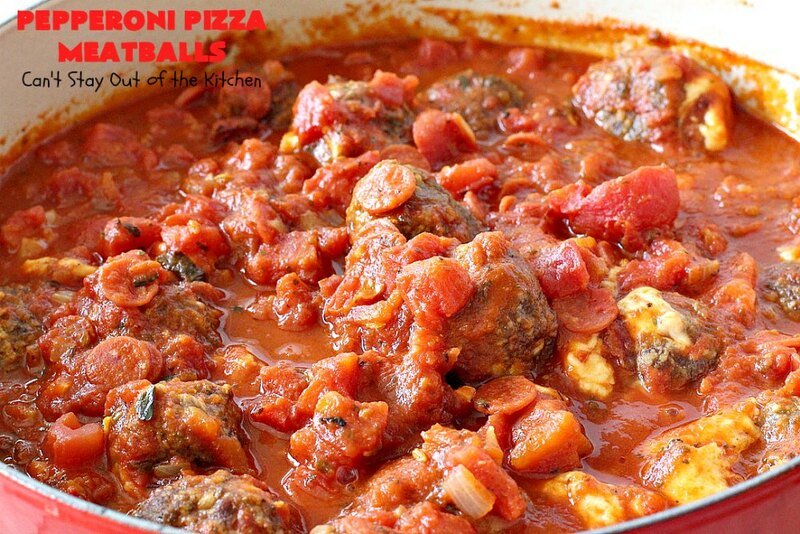 If you enjoy Pepperoni Pizza, you’ll find Pepperoni Pizza Meatballs the best comfort food ever! These receipes sound delish. Cant wait to try the pepperoni meat balls.